My summer has begun and so have my summer tasks. One such task was to finish all of the projects that I started over the years. Yes, some of them have taken longer than a year. And don't ask me how long ago my mother died ... cuz that would be exactly how long her boxes of treasures have been sitting in my garage. I've even moved once (soon to be twice) before unpacking them. 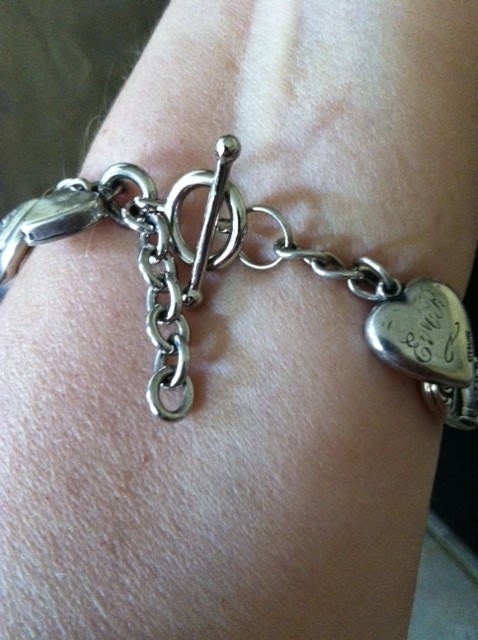 In looking through some of my mother's things, though, I did find this bracelet. Not a huge surprise because I knew that I had it somewhere. My mother loved this and hung onto it since ... get this ... since she was a teenager. 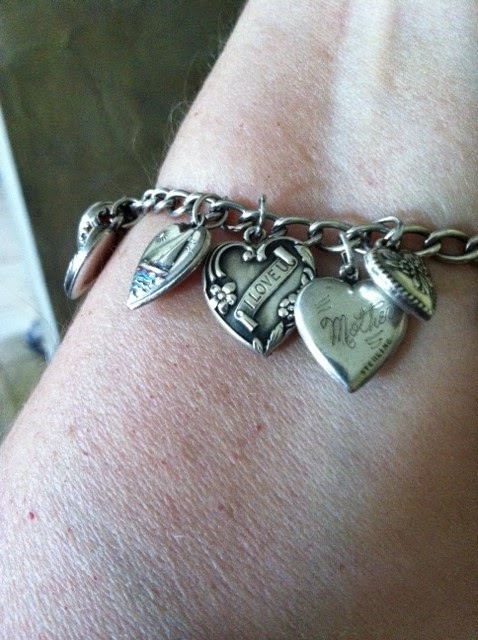 My mother was a darn popular lady and some of her friends got together and gave her a charm bracelet for some long forgotten (to me) occasion. 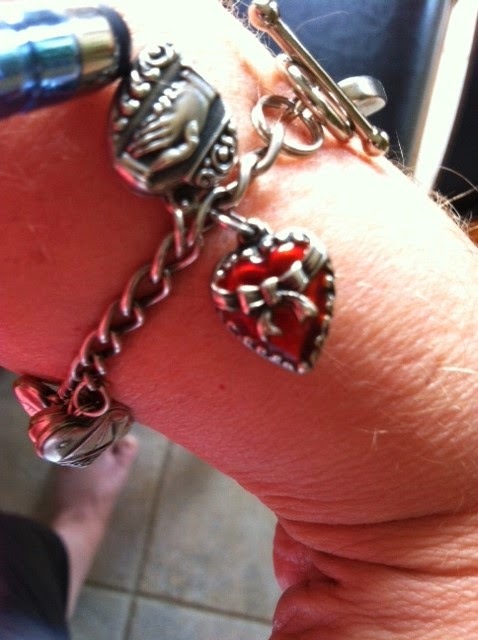 And each person placed a silver heart charm on this bracelet. Did she wear the bracelet? No. Why, you ask? 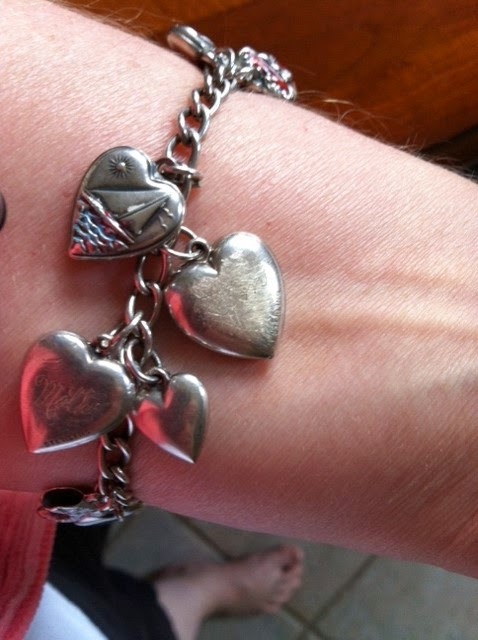 Well, apparently each heart was from a sweetheart, admirer or boyfriend ... and my father was not so fond of that fact, nor of the bracelet. Still my mother hung onto it. When I pulled it out of storage this past week, I cleaned it up. It cleaned up nicely. No longer were all of the hearts blackened with tarnish and age. I see a little cowboy boot there ... I guess they weren't all hearts. 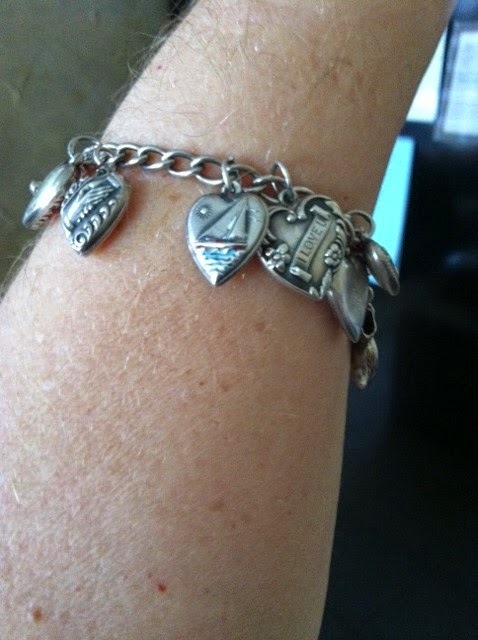 One heart has a hand on it, one heart has a sailboat on it. 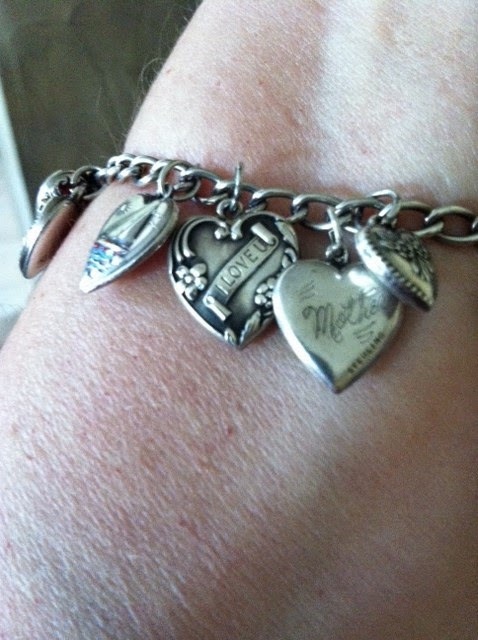 Most have a boy's name on the back, signifying who gave her that heart. Most of the boy's names are gone now. Either they were scratched off or age erased them. Above is one heart that says "I Love You". I turned it over and saw the name of my father on the back. I guess he wanted in on all the love, too. The heart that says "Mother" on it piqued my curiosity. It wasn't from me. It probably wasn't from my brother. It possibly was from her own mother. There were a few other hearts that had girl's names on the back. And there I got really confused. The hearts with all the boy's names were few and far between. And I DO mean far between. There were quite a few hearts missing. My father strikes again! This little red heart intrigued me. I was surprised it held its color so well after so many years ... and after the scrubbing I'd just given it. See these backs? I defy you to find any boy's names on them. I also defy you to find the shoe that belongs on that foot down there. I'm proudest of this... the concoction of links and mismatched silver thingys that I used to put this bracelet back together. Hey, I said I was tackling my projects. I didn't say I was good at it. Know what intrigues me the most? How come my skin is SO WHITE! Good grief, you'd think I lived in Texas and never made it to a beach anymore. Know what else? My skin is loose and wrinkly. 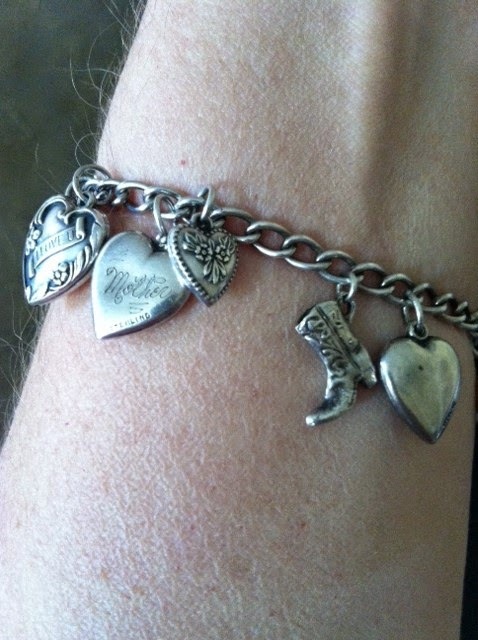 Maybe I've been alive since this bracelet was born, too. Maybe it's really mine. That would definitely explain the lack of boy's names on the hearts.